Is it still possible for Satan to repent? What about the demons? The Greek word used for repentance in the New Testament is “metanoia” and it means “a change of mind,” but it is much more than simply changing our mind. It is a change of direction. It is a turning away from and forsaking sin and then turning to God, but repentance should result in a changed life and not just changing one’s mind. It should result in a new creation in Christ (2nd Cor 5:17). Jesus said that for some, the seed of the Word of God would land in good soil and “they are those who, hearing the word, hold it fast in an honest and good heart, and bear fruit with patience” (Luke 8:15), so someone who is brought to repentance should be living a life that looks like it. If humans can repent at any time, and given the fact that God grants repentance (2nd Tim 2:25), why can’t Satan or the demons repent? Is it too late for them? First of all, repentance is not something that we can do on our own. God initiates it in us by His Spirit? The Bible teaches that we must repent and believe in order to be saved, because we cannot be saved without repentance and faith in Christ, but can we turn to God without turning away from sin (1st John 3)? And, does it depend on us? The Bible teaches that we are dead in our sins (Eph 2:1), and dead men and women can’t make decisions. That would be like asking Lazarus, who was 4-days-dead, to contribute to his own resurrection from the dead by doing something. Lazarus would have never been raised from the dead without Jesus’ saying, “Lazarus, come out” (John 11:43). It wasn’t, “Okay Lazarus, I’ll raise you from the dead, but at least move your little pinkie or move an eyelash, or something and I’ll do the rest.” This is why I believe God is responsible for our being brought to repentance. Even though we might believe we must do this on our own (as I once did! ), it’s just not possible for us to repent by ourselves. Our hearts are too deceptively wicked for that (Jer 17:9). In the Parable of the Prodigal Son, the son had blown all of his inheritance, and only then did he realize that he had sinned against God, so he thought of a plan. He would try to ask his father’s forgiveness in the hopes that he’d at least be allowed to be one of his father’s servants, because his servants had food and shelter. When the Prodigal Son finally “came to himself, he said, ‘How many of my father’s hired servants have more than enough bread, but I perish here with hunger’” (Luke 15:17), so “he came to himself,” but I don’t believe he came to himself, of himself. God allowed the circumstances of the pig pen and hunger to humble him. That brought the son to an end of himself. When the son was returning, the Prodigal Son’s father had been waiting and watching…and when he finally saw his son, still a long ways off, he ran to him and embraced him and showered him with kisses and rejoiced, saying, “For this my son was dead, and is alive again; he was lost, and is found.’ And they began to celebrate” (Luke 15:24). The father took the initiative, just like our heavenly Father did. He knew the exact moment when we would be drawn to Him (John 6:44). The Apostle Peter told the Sanhedrin that “God exalted him to his own right hand as Prince and Savior [Jesus] that he might bring Israel to repentance and forgive their sins” (Acts 5:31). God desires all to repent and be saved, but as we shall read, God is the One Who grants it. 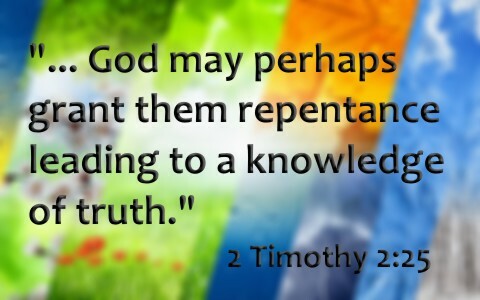 In writing to those who oppose the gospel, the Apostle Paul hopes that “God may perhaps grant them repentance leading to a knowledge of the truth” (2nd Tim 2:25). Why didn’t Paul say, “I pray they will repent?” Because they cannot repent unless God grants it since they are dead in their sins (Eph 2:1) and dead men can’t do anything, especially if they’re blinded by the god of this world, Satan (2nd Cor 4:4). Please don’t misunderstand. It’s good to pray that God grants someone repentance, but this is God’s prerogative and He is the initiator of repentance. This explains why Paul desired “that they will come to their senses and escape from the trap of the devil, who has taken them captive to do his will” (2nd Tim 2:25). Until they are freed from the enemy’s snare, they cannot “come to their senses,” and this is why Paul desires that “God may perhaps grant them repentance.” The fact that God “desires all people to be saved and to come to the knowledge of the truth” (1st Tim 2:4), shows that people are still responsible for their actions, but ultimately, they are not be responsible for their own salvation. Can Satan or Demons Repent and Believe? The Apostle John “went into all the region around the Jordan, proclaiming a baptism of repentance for the forgiveness of sins” (Luke 3:3), and told the crowds to “Bear fruits in keeping with repentance. And do not begin to say to yourselves, ‘We have Abraham as our father.’ For I tell you, God is able from these stones to raise up children for Abraham” (Luke 3:8). After John the Baptist was put into prison, something happens at the immediate moment. It’s like John’s imprisonment is a sign post for Jesus to begin preaching the gospel as it says , “after John was arrested, Jesus came into Galilee, proclaiming the gospel of God, and saying, ‘The time is fulfilled, and the kingdom of God is at hand; repent and believe in the gospel’” (Mark 1:14-15), and what was the gospel Jesus preached? Was it different from John’s call to repentance? No, it was the same thing, essentially, and it included the necessity to repent and believe. Now, can the demons or Satan repent or believe? We know the demons believe and tremble (James 2:19), but that doesn’t mean they’re saved. James doesn’t even hint about the possibility of their being saved, and neither does any other author in the Bible. James says the demons believe but they’re still opposed to Christ. That didn’t’ change them. The Bible has so many references about the fate of the Devil and his demons that we know he will choose to not repent. Eventually, they will all be cast into the lake of fire (Rev 20:10). Prophecy is like history written in advance, and what God has said will come to pass, will come to pass, and nothing or no one can stop it, so head knowledge alone (as the demons and Satan have) is useless unless it is lived out in a person’s life. There is no evidence that Satan or his demons will be saved. If God had planned to save Satan and, we believe 1/3rd of the angels that followed him, He wouldn’t have written the prophecies of their coming judgment. What God plans to save, He saves to the uttermost. Jesus said, “All that the Father gives me will come to me, and whoever comes to me I will never cast out” (John 6:37), so “that I should lose nothing of all that he has given me, but raise it up on the last day” (John 6:39b). Jesus sounds pretty sure of Himself, doesn’t He? He is, and Who can take those whom the Father has given Him out of His hand or even out of the hand of the Father (John 10:28-29)? Obvious answer: no one! More reading for you: Why Did God Create Satan? Thank you Mr. Miller for the encouragement. I was going to comment on your website on your list of books to read for spiritual growth A.W. Tozier, The Knowledge of the Holy. It is one the smallest, yet potent books about the attributes of God I’ve ever read. Thanks for this deep message. Thank you for the encouragement. All glory to God (1 Cor 4:7). Sadly we can’t fix everything hence the reason for so many people committing suicide each year. When a child is bullied they feel they can’t fix it and make it better so they commit suicide. Jesus is there to take the load and make things better when we can’t fix things ourselves. Through prayer we can give it to Jesus and he will protect us from harm. Agree and disagree. You say, “Jesus is there to take the load and make things better when we can’t fix things ourselves.” He makes all things “better” in that He saves us from our sins. We are eternally secure in His hands and in that way all things are “better”. We therefore have hope for a “better” life in this knowledge (our mind’s rest in this knowledge…mental or “soul’s” hope). We have a “better” hope in knowing Him in this life and being with Him forever(our spiritual hope). We may not have a “better” physical outcome though. You write, “Through prayer we can give it to Jesus and he will protect us from harm.” Jesus does protect us from harm often as we pray. I pray God’s protection upon my children and grandchildren every day. I also pray for those Christians who are undergoing persecution for their testimony of simply being Christians and protection and deliverance for their families. It so happens that often these Christians are called upon to suffer and die for their testimony. It is going to come upon us perhaps in our lifetimes to be arrested for standing up publicly for our beliefs also. So following Jesus may not always protect us from physical harm. Our faith in Jesus may place us directly in harm’s way. “Can anything ever separate us from Christ’s love? Does it mean he no longer loves us if we have trouble or calamity, or are persecuted, or hungry, or destitute, or in danger, or threatened with death? (As the Scriptures say, “For your sake we are killed every day; we are being slaughtered like sheep.” No, despite all these things, overwhelming victory is ours through Christ, who loved us. Well said Doc. Scripturally, spot on my friend. Previous post: What’s The Difference Between Calvinism And Hyper-Calvinism? Next post: Is The Atonement Limited Or Is It For All People?